Considering that termites can build extensive nests beneath your home or inside your walls, and that they can make treatment and prevention a complex project, the best thing left to do is to let trained Mesa termite control professionals do the job that most would not be comfortable doing in the first place. A queen termite can lay around 2,000 to 3,000 eggs per day, ensuring the survival of colonies that can survive for decades. Note that an effective termite control requires proper identification of the termite species as well as a comprehensive inspection of the site to help determine the full extent of the infestation. Once the termite species and approximate location have been determined, your termite specialist can discuss termite repellents (termiticides) or other methods that may be effective in controlling the infestation and preventing future re-infestation. Professionals likewise have the equipment needed to complete different approaches of termite treatment (i.e. fumigation, heat treatment, and soil treatments). While there are common household items as well as garden plants that possess insecticidal and repellent properties, experts claim that there is no effective homemade termite repellent. 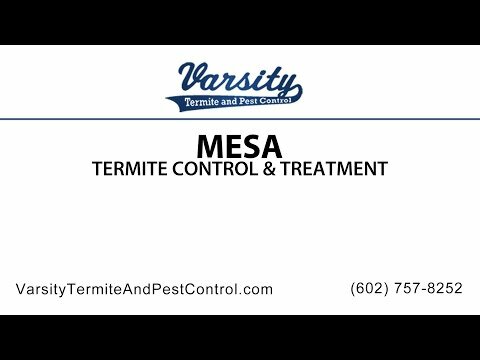 Effective Mesa termite treatment needs to find its way to the whole colony directly or through products that scavenging termites can share with the rest of the nest. However, homemade products are not formulated to protect properties on possible re-infestation, nor are they made to wipe out the entire termite populating a location. Other considerations in conducting a termite management method include the time of day, temperature during which the method is to be applied, the season, as well as the type of environment where the treatment is to be conducted—all these have impacts on termites as well as the methodology used in managing them. Contact us today!